We might all be able to agree that most of the world is a mess. The Americas and Europe have taken a ginormous step back in terms of production, innovation, and general flourishing. Many of our nations and states are in obscene debt which appears to be stagnant or rising and there is no end in sight. 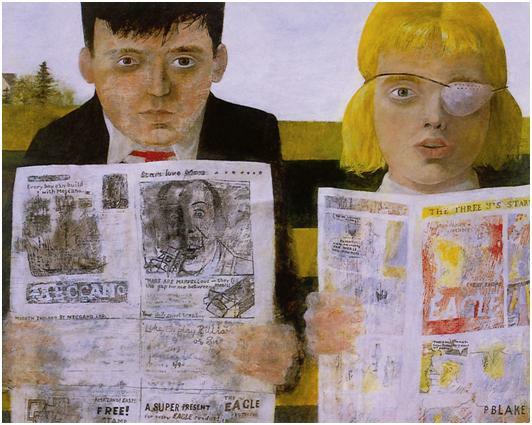 Sir Peter Blake, Children Reading Comics, 1954. Oil on hardboard, 36.9 x 47.1 cm. Tullie House Museum and Art Gallery, Carlisle (Cumbria). So then, what should be next? Vampires and Zombies aren’t getting us anywhere – speaking of zombies, I very much blame Will Smith and I Am Legend on this whole fiasco of eating brains, bleh. Superhero idolisation is equally out of control – how many times are we going to make Superman and Spiderman? (I’m rather biasedly pro-Batman, so he’s still a-go.) Lisa Frank tried to exploit adorable baby animals, and that worked for those of us who are now in our mid-to-late 20s, but kids today just won’t find all of her rainbow colours as rad as we did. Kids today wouldn’t dare say rad. Martial Raysse, Souviens-toi de Tahiti en septembre 61, 1963. 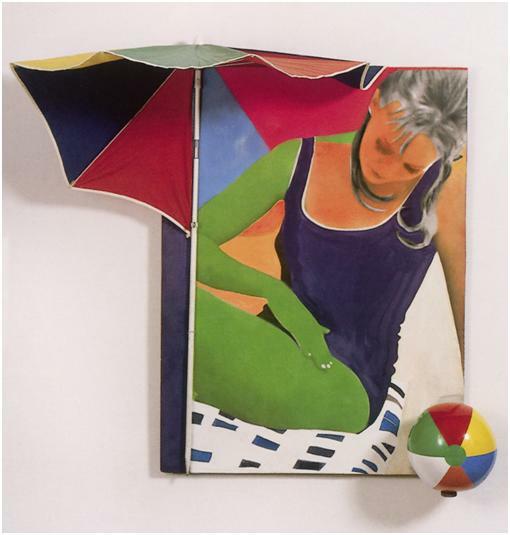 Photograph, acrylic, and screenprint on canvas, parasol, ball, 180 x 170 cm. Louisiana Museum of Modern Art, Copenhagen. Really, what do you think should or could be the next major art movement? Whilst you consider this, check out Pop Art Designs on at the Louisiana Museum of Modern Art in Copenhagen through 29 June. Get a closer look with Pop Art by Eric Shanes, available on ebook-gallery.com!